The biomechanics of a world class javelin throw are similar to the underlying concepts of a perfect momentum trade with the PTS. I was a good javelin thrower 20 years ago and due to the current demand I watched some scientifically profound videos on YouTube about javelin throwing. I made an astonishing discovery while watching the videos: The edge which I found in the financial markets that which I programmed into the PerfectTrendSystem is based on exactly the same concepts which I was taught 20 years ago to become a better javelin thrower. Most certainly I was subconsciously applying the javelin concepts to the financial markets all the time without knowing it. And over many years, thanks to the javelin education and my programming experience, I am now able to calculate high probability setups in any fast moving trading instrument on any timeframe. This article will examine the perfect momentum setups from a complete different point of view and in more detail than in the previous article "How To Spot Perfect Momentum Setups". Multiple coincides led to a first javelin training in a new athletics club after a pause of around 20 years. The main purpose of the training was to see if my 40 years old bones and joints are still able to throw a javelin without getting an injury. And then, if my body stays OK, maybe then I would participate in some small local competitions again, because javelin throwing was always fun for me and I missed it a little bit. But it seems that the weight lifting training with my daughter in our basement has kept me in quiet good shape over the years. To my surprise, the javelin even reached the regions where I was able to throw when I was 18 years’ old. And except for a huge muscle hangover over the next four days, my body didn't have any other problems. I was happy with the results and thought to myself: "Not bad for a first session without any special training over the last 20 years". Back at home I started an online search to compare my results with the results of the other throwers in the federal state where I live in Germany. My research showed that no other 40 years old active javelin thrower in our state has thrown as far as me during the past years in any competition, and I can even compete with the younger javelin sportsmen in our state. Further research into the results of 40 plus year-old throwers, I found a YouTube video of a German thrower was standing on the winner's podium of the European Championship in 2015 (for age 40+), and he won the bronze medal with the same throwing distance as me in my first throwing training session after my long pause from the sport. Seeing this, my ambition to start training for javelin again immediately reached a whole other level. And even more so as I further found that all the gold medalists over the last 10 years were less than 7 meters farther than mine in my recent attempt. 7 additional meters is very achievable for me if I do some specialized training. That was the moment when the new project was born: Winning the European Javelin Championship (for age 40+) in March 2018 in Madrid! Now I will shift my training style in our basement more on the direction of speed strength and of course I will regularly take up javelin training sessions. And to add to the probabilities (learned from trading ) that I get the missing 7 meters within the remaining 7 months I started watching scientific javelin videos on YouTube where I made an astonishing discovery. I shall now explain why a world class javelin throw is very similar to a perfect momentum trade with the PTS. And with this comparison you will learn more about the perfect momentum setup and what you have to look for. 20 years ago the internet was new and there was not a lot information about javelin available on the internet. All I could rely on was the knowledge of my javelin trainer. Today there is a lot of scientifically sound information about javelin available, especially on YouTube. 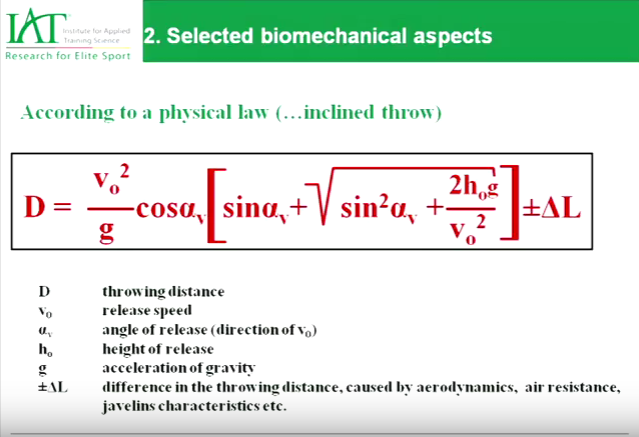 Since I would like to achieve the 7 additional meters I order to win in March, I started watching some good videos about the biomechanics of javelin throwing. In one of the videos I found the proof that everything that my javelin trainer taught me about the correct movement during throwing was totally right. And funny enough I instinctively found an edge in the markets some years ago based on the same principles. There is a formula for javelin throwing available which is derived from the results of the analysis of thousands of javelin throws (which is by the way also a good sample size for analyzing trading setups). If you know the values of the components of this formula then you can calculate the distance of a throw. There are multiple terms in this formula, which have an effect on the throwing distance. But according to the explanations in this youtube video the "release speed" term has by far the biggest impact of all. Building pre-tension before the javelin is released while not losing too much of the speed of the run-up. These two components (fast run-up / building pre-tension) are exactly the same components on which a perfect momentum trade is based on. And the quality of each component decides the quality and therefore the success rate of the entire perfect momentum trade! And as you will see later, the PerfectTrendSystem makes the quality of the setup measurable. Therefore, with the values of the PTS you are able to bet your money only on high quality setups with highest probability of success. Now let's compare a javelin throw and a perfect momentum setup. On the left side of the following sketch is the schematic sequence of a javelin throw. 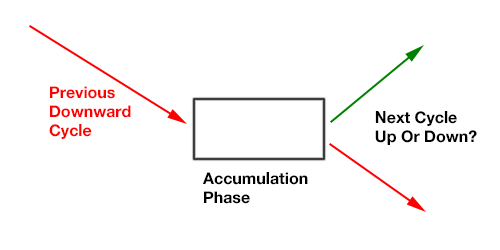 On the right is the schematic sequence of a perfect momentum trade. 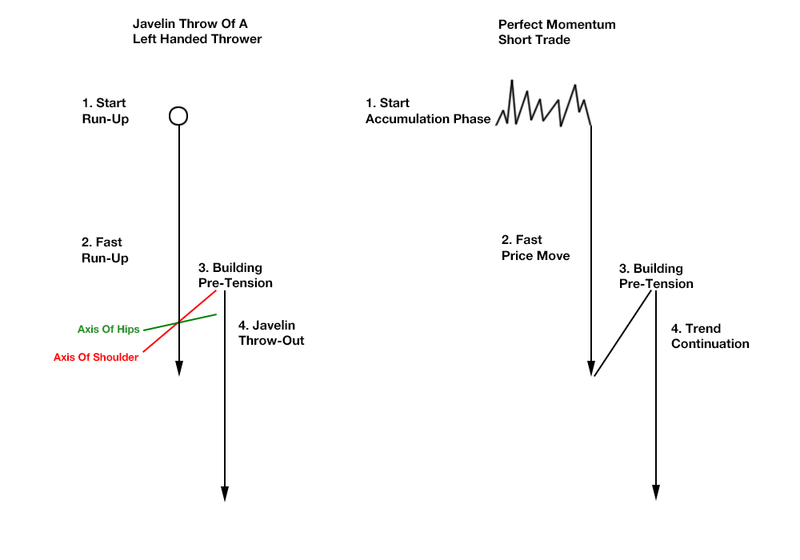 The javelin throw and the perfect momentum trade have exactly the same 4 phases. Now we will take a detailed look into all the 4 phases. We will start with the javelin throw because with the explanation of the javelin throw you will probably be able to remember the phases of a perfect trend setup more easily. The German javelin thrower Thomas Röhler has a nearly perfect technique. He is the 3rd best thrower of all time. The following video shows his best throw to date with a distance of 93.90 meters. As you can see in the video there was a clear starting point of the throw. He prepared the throw by moving his arms and making small jumps while staying more or less on the same position. Then he started the fast run-up and tried to accelerate as much as possible. In the third phase he builds pre-tension by moving the axis of the hips into the direction of the throw while the axis of the shoulders stayed laterally. If you want to see the building of pre-tension video you can watch this here. The javelin throw-out phase is the last phase. Like a catapult the throwing arm continues the move which was initiated by the rest of the body. A perfect momentum trade has the same 4 phases as a world class javelin throw. The values of the PerfectTrendSystem especially during the phases 2 and 3 will tell you objectively when a highest probability setup occurs. 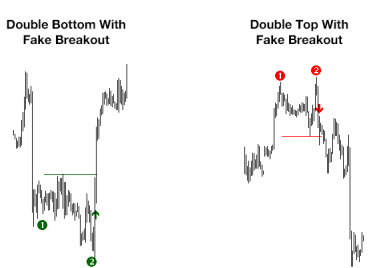 Your job is to detect those perfect setups with the help of the indicator values. The following explanation will show you exactly what you have to look for. The more selective you are with the setups the higher your success rate will be and the less pain you will suffer during trading. We will now analyze all 4 phases and the underlying concepts in detail. The underlying concepts that the PTS exploits are a bit complicated. But it is beneficial to know the basics. If you know the basics of the underlying concepts, the PTS will no longer be a "black box" for you. Then you will know that the PTS is based on sound trading knowledge and that you will exploit a constantly repeating market cycle. And as you will see, the PTS makes it easy to sccessfully trade based these concepts. In fact a small part of the concepts that you need to know is so easy that it takes me only 2 seconds to look at a chart and to decide whether a perfect momentum setup exists. 1. There was a preceding trend. 2. Then a price range developed. During a price range the blue line moves close to the choppy price, which signals a lack of momentum in the market. The smart money is the driving force in every financial market. Because the smart money trades the biggest amount of money it can't enter its total position size all at once. It has to enter and exit the market smoothly and with a well thought out plan. In Forex the smart money comprises the multinational megabanks. They also act as market makers. If you want to know more about the role of smart money please read my article series on this topic. During the preceding downward trend in our example, the smart money gives more and more of its short position back to the herd. 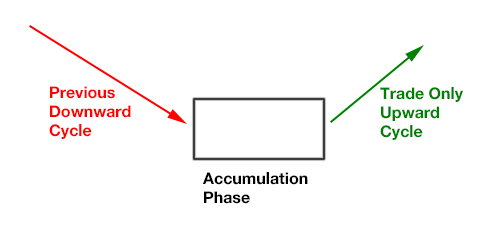 The downward cycle is the profit release phase of the smart money, because it has already accumulated its short position before the downward cycle started. During the downward cycle, the herd is selling while the smart money (with the role of the market maker) is buying. At the end of the downward cycle, the smart money is now preparing its next tactical move (a new upward or downward cycle). To accomplish this, the smart money now holds the price within a range. 1. We will see an upward cycle if the herd sold enough short positions during the downward cycle such that the smart money managed to give its entire short position back to the herd. During the last steps of the downward cycle the smart money even turned from net short to net long because of the heavy selling done by the herd. In this case the only purpose of the price range (the accumulation phase) is to accumulate the final amount of long orders. After the intended amount of long orders is collected the price is driven out of the accumulation zone by the smart money with a very fast price move. 2. We will see an additional downward cycle if the smart money stayed net short during the downward cycle. 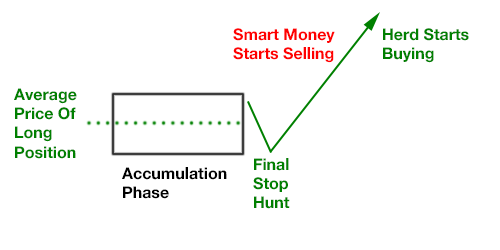 This can be due to several reasons, like the herd was not selling enough, the initial short position of the smart money was extreme big or the smart money could re-accumulate its short position during the downward cycle with stop-hunt opportunities. Independent of the reason, if the smart money wants to induce an additional downward cycle then the only purpose of the price range (accumulation zone) is to accumulate the final amount of short orders. After this task is completed we will see a fast and strong downward move out of the price range. 1. There is an explosive fast price move against the direction of the preceding cycle. 2. The blue line moves with the strong price move. It looks as if the price moves on the path of the blue line. Only a small deviation is allowed. 3. The orange line must be on the same side of the moving average as the blue line. The further away from the moving average the better. 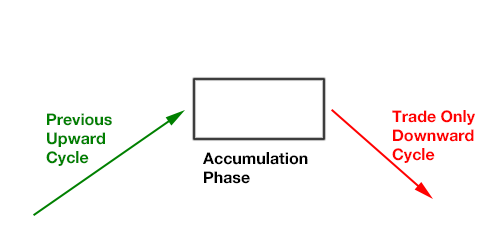 Most of the time an explosive fast move out of the accumulation zone occurs. This move starts the profit release phase of the smart money. Now the smart money has revealed the direction of the next cycle. Why does an explosive fast move occur most of the time, driving the price out of the accumulation zone? We can assume that the average price of the position of the smart money lies anywhere within the minimum and the maximum price of the accumulation range. The smart money is very much interested to see its long position in profit before the majority of the herd starts buying. Please remember, because of the sheer size of the smart money the smart money automatically acts as a market maker. And because of the role of the market maker, if the majority of the herd is buying then the market maker is automatically selling. Therefore, the smart money drives the price very fast to a price level where the overall position of the smart money is in profit. If you want to have the highest possible quality with your trades then you should select only the setups which are directed against the direction of the previous cycle. 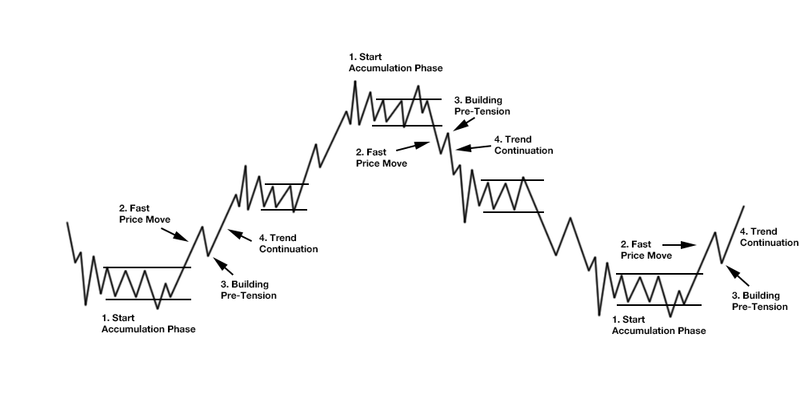 Why you should only trade against the direction of the previous cycle? The reason is that on average you will see stronger in the opposite direction of the previous cycle. Your winning percentage will be higher. Have you heard of the trading wisdom "The biggest momentum is in the market turning points" before? During a downward cycle the herd gets more and more net short while the smart money gets more and more net long. At the end of the downward cycle the smart money initializes an explosive upward move against the direction of the previous cycle. This explosive upward move hits a lot of protective buy stop orders of herd (which were short positioned) which further drive the price upward. The explosive upward move also scares a lot short positioned members with a wider stop out of their position. The smart money is also interested in further rising prices as long as they hold a net long position. I have described this imbalance in detail here. 1. Is the blue line moving steadily further in the direction of the preceding fast price move while the price makes the first pullback? 2. Does the orange line start leading before or anywhere during the pullback phase? The pre-tension phase is the most important phase in javelin throwing and for the perfect momentum setup. This phase starts with the first bigger pullback after the fast price move. 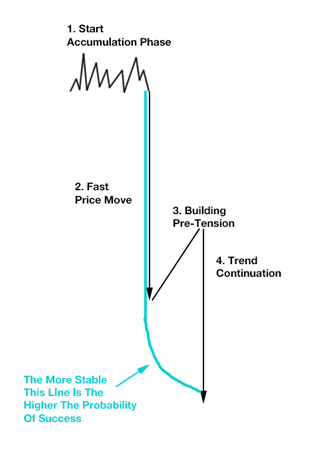 The pre-tension phase reveals if the preceding price move was strong enough and if the smart money allows the price to make a further continuation move into the direction of the of the fast price move. The following sketch shows what pre-tension means in the context of a perfect momentum setup. After the fast price move the price starts a pullback while at the same time the blue line moves further into the direction of the preceding fast price move. The more stable (the less choppy) the blue line moves further away from the price the higher the probability of success for such setup. A stable moving blue line is usually a sign that the pullback is smooth, which we prefer. In contrast, a sharp pullback (and a choppy blue line) is usually a sign that the big market participants are absorbing the initial fast price move and want to reverse the direction. In the examples above you can see that the orange line starts leading at least anywhere during the pullback. After all conditions of the 3 phases are fulfilled and you decided to enter into the setup, then you have to ask yourself where to exit. As always in trading, the selection of your exits should fit your personality. The well known trader and author Steve Burns provides a very interesting and sometimes even quite funny twitter feed. He is also blogging very informative stuff about trading on his website newtraderu.com. He recently posted the following tweet in which he mentioned the exact same observations which I made during many years of studying the markets. He also says that trends usually start with a strong momentum move.